When we look at most kitchen ideas on websites, in showrooms and in kitchen brochures the majority of them are nothing short of palatial – huge sprawling kitchens that showcase the best of what that company offers. That’s great for giving you an idea on what’s available but if your kitchen is more like Harry Potter’s bedroom under the stairs than Hogwort’s Great Hall you need to know a few tricks to make the best use of that space when designing your new kitchen because micro kitchens can be just as practical and beautiful as large kitchens. By definition, small spaces need more thought than larger ones and can sometimes end up being a more useable space because every detail has to be considered for its practicality. Don’t ever assume that you can’t do much with a small kitchen because, thanks to clever storage options, strategic use of ‘dead’ space and a few inspired ideas, this is really not the case. Extend cabinets all the way to the ceiling for extra storage space (and less ‘dust-gathering’ area!). Use the high shelves for less commonly used items or consider some pull-down shelving within the units that allows for easy access. High cabinets also look less fussy and create a cleaner, slicker finish which will help your space to look bigger. Access difficult-to-reach or redundant areas with clever pull out shelving and drawers. Shelving can be pulled manually or automatically via a mechanism. We recommend drawers that pull out independently so you’re only moving one at a time (full pantry pull outs can become quite heavy when fully loaded). Swing shelves can maximise space in corner cupboards and drawers that fit around sink space can maximise every bit of available space. Dividers within drawers and cupboards help you organise the items within so you can make the most of the space and find what you need easily. If you are really limited on space but have high ceilings you could make use of it and create a ceiling hanging rack for pans. Likewise, if you have some wall space but not enough space to add full depth units you could create some open shallow shelves for smaller items or pan hanging racks. Some believe that a small space means you won’t be able to fit in anything but essential appliances such as a dishwasher or tumble dryer but that doesn’t have to be the case. You can now get compact versions of most kitchen appliances including dishwashers and even fridges and ovens. You could also consider stacking your washing machine and dryer to save on horizontal space (and save some bending down!) or consider whether you have an alternative area for these such as a garage or cellar. If work surface space is limited consider raising small appliances such as microwaves or even coffee machines by building them into your unit configuration. Think logically about where you can steal space. Do you have a chimney breast that you can knock into or can you create a bigger space by taking out a wall. Where there’s little horizontal space, such as in a galley kitchen, even small details like handle-less units can make a difference. If work surface space is at a premium why not have a sink with a chopping board that sits on the drainer or even the sink itself. Think about what you really need in your kitchen. Are you storing old pots and pans and dinner services that haven’t been used in years? Do you have a cupboard full of carrier bags or herbal teas that you don’t use but can’t bear to throw away? Planning a new kitchen is the perfect time to have a really good clear out to get rid of the things that will steal your space and add no value. You may think you need 8 cupboards but you may only really need 5. Keep the items you use regularly and purge yourself of the clutter! You can see a range of kitchen design ideas for micro kitchens on our Pinterest board on the subject. We have created kitchens of all sizes. While a large space gives us lots of scope, we also like the challenge of creating something just as practical and beautiful in a very small space and hopefully our designs will leave you wondering why you ever thought you needed a bigger kitchen in the first place! 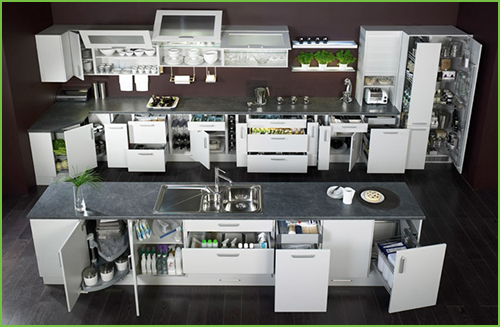 Want to see what we can do with your small kitchen? Contact us to arrange a design consultation. 1 Response to "Micro Kitchens"